The Al-Khazneh of Petra and the Cathedral of Byzantium are added to the Wonder boards already available. The City cards, which are black in color, are a new category of cards. During each game, some will be randomly added to the Age I, II and III cards. The new Guilds and new Leaders are to be added to those already available. Note : some of these cards can only be used with the Cities expansion. All the cards from this expansion have a mask symbol in their bottom center to be able to sort them easily after use. From now on, cities can lose money and even incur debts, shown by the Debt tokens (-1 VP and -5 VP). The Diplomacy tokens are used to show the new "Diplomacy" effect. A new booklet of scorecards is present in the box : it will allow you to add the victory points earned by some City cards to your scoring, as well as team scores. 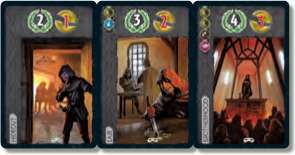 Add to each of the three Age decks as many black cards (of the corresponding Age) as there are players. Clarification: choose these cards randomly and without looking at them. The remaining cards are set aside and will remain hidden; they are not going to be used during the game. The new Guilds are added to the old ones but the number of guilds to be used in play remains the same (number of Guilds = number of players + 2). The Debt and Diplomacy tokens are placed in the middle of the table, with the coins and the Conflict tokens. Example: Kurt is setting up a game for 6 players. He's removed the 7+ cards from the basic game. He randomly picks 6 Age I City cards, 6 Age II City cards and 6 Age III City cards, adding them to the decks of Age I, II and IIl cards respectively. He also adds 8 Guilds to the Age III deck. At the beginning of each Age, the players each get a hand of 8 cards (instead of 7 as in the base game). During each Age, the players will thus get to each play one extra card. The other rules regarding the proceedings of the game remain unchanged. The effects of the new cards are detailed in the following pages, but 2 new mechanics require detailed explanation: debt and diplomacy. A card with the symbol causes a loss of coins to all of the opponents of the player who has put this card in play. Each opponent must pay the corresponding amount to the bank or take a Debt token for each unpaid coin. It's possible to split this up, meaning pay part of it in coins and take Debt tokens for the remainder. At the end of the game, each Debt token causes a loss of victory points for the player who has them. the player who puts a card that causes a monetary loss in play is never affected by that card. the coins lost by the players are paid to the bank. the debts incurred cannot be paid back. Example: the Lair card has just been played by Kurt. Each other player must pay 2 coins at the end of the current turn. Joan decides to pay the 2 coins: she hands them to the bank. Cyril only has one coin in his treasury but decides to pay it in order to only gain one Debt token. Tina has the required coins but decides to keep them for later in the game: she therefore takes 2 Debt tokens. 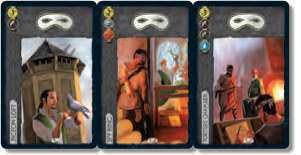 A player who puts into play a card with the symbol takes a Diplomacy token from the bank and places it on their board. It is proper to announce to your opponents the fact that you're taking a Diplomacy Token, in order to have avoid getting a bad surprise during the next conflict. During the next Conflict, the player will not take part in the resolution and then MUST discard this Diplomacy token. The player is considered absent during the resolution, and does not take any Conflict tokens (victory or defeat). The player's two neighboring cities are considered adjacent (for this Conflict only) and face off militarily according to the usual rules. Example : During the Age I of a game, Tina puts the Residence card into play. At the end of that Age, Tina doesn't take part in the conflict resolution. Her two neighbors, Cyril and Kurt, compare their military forces and take the Conflict tokens as if their cities were neighboring. 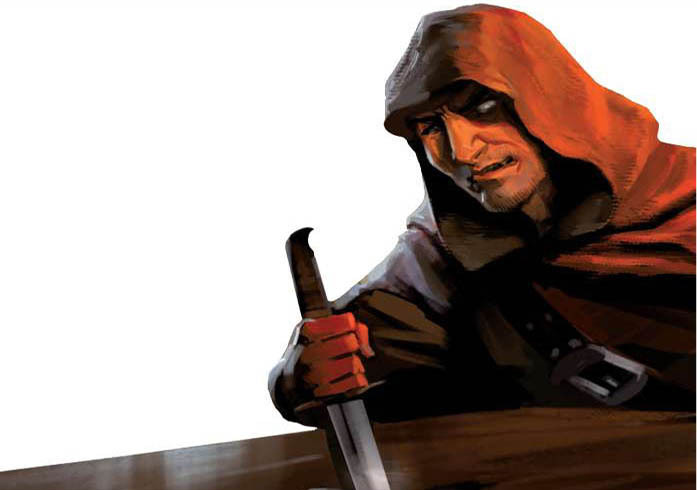 A player can take multiple Diplomacy tokens but MUST discard one during each Conflict resolution. A player who has a Diplomacy token MUST use it during the next conflict phase (even if that player is militarily stronger than the neighboring players). Important: If there are ever only 2 players left during a conflict resolution, they only face each other once and each take a single token. Example : During the Conflict resolution of Age I, Kurt and Alex aren't participating (they each discard a Diplomacy token previously acquired). Tina doesn't have any Diplomacy tokens left and must thus wage war. Tina and Cyril compare their military might as per the usual rules. Tina wins but only takes a single Age II Conflict token as she only had one opponent during the conflict phase. 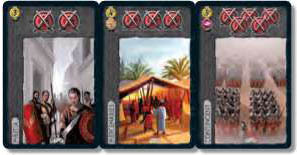 As in the base 7 Wonders game, the game ends at the end of Age III, after the Conflict phase. 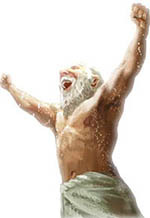 Each player totals the points of their civilization, and the player whose total is the highest is declared the winner. for more simplicity, include the Debts in the "coin"line of the scorecard. the points for the black cards are totaled together with those of the white cards (Leaders). Example: Kurt ends the game with 3Debt tokens. Since he has 5coins in his treasury (1 point), he writes 2 points (1 coin point - 3 debt points) on the coin line of his scorecard. These three cards grant a symbol. At the end of the game, each mask allows the controlling player to copy the scientific symbol of a green card present in one of the two neighboring cities. if a player possesses multiple symbols, he or she can only copy a given card once, and must thus copy as many different cards as they have symbols. It is possible to copy the symbol of a card even if a player already has a copy of that card in their own city. A player can copy two identical cards (if they have enough masks) if both neighboring cities have a copy (copy a Workshop card in the left city and a second Workshop card in the right city). Example: At the end of the game, Alex has 2 cards with the symbol. The player to his left only has one green card, with the com- pass symbol The player to his right has played no green cards. Alex's first therefore counts as a symbol, but his second is useless as there are no other symbols to copy. If the player to the left of Alex had had 2 green cards with a symbol each, Alex's 2 masks could've counted as . These three cards offer more shields than the red cards of the corresponding Age (respectively 2/3/5 Shields). 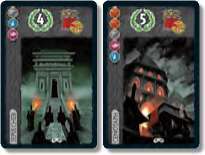 These three cards earn victory points and cause monetary loss : every other player must pay 1/2/3 coins (respectively) to the bank at the end of the turn in which the card is played. 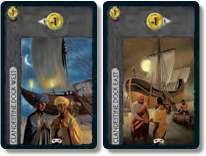 These three cards earn victory points and each grants a Diplomacy token. Note : the effect of Diplomacy tokens changes when using team rules. The player takes 6 coins from the bank. The player's two neighbors each take 1 coin from the bank. The player takes 9 coins from the bank. The player's two neighbors each take 2 coins from the bank. Each turn, the player has a commercial rebate of one coin on the first resource (brown or gray) they buy from the neighboring city (left or right depending on the symbol). This rebate is cumulative with that of a Market or a Counter : the first resource bought can thus be free. Example : Alex own a Market and a Clandestine Dock (East). He buys a Textile resource and a Stone resource from the neighboring to his right (East) : the Textile costs him 0 coins (1 coin rebate for the Market and 1 coin rebate for the Clandestine Dock), the stone costs him 2 coins. OR, the stone costs him 1 coin (1 coin rebate for the Clandestine Dock) and the textile costs him 1 coin (1 coin rebate for the Market). These cards earn victory points and the other players must pay 1 coin to the bank for each Victory Conflict token (no matter its value) in their possession. Starting from the moment the Architect Cabi- net enters play, a player can build his or her Wonder stages without having to pay their resource costs. Clarification: The cost in coins for some Won- der stages must stil be paid, however (Petra). Each turn, the card produces a resource of the player's choice from among those that their city doesn't produce through the use of its brown and gray cards or the initial resource of their board. Clarification : the Secret Warehouse doesn't allow players to double the production on yellow, white, or black cards (Forum, Caravansary, Bilkis and Black Market). Each turn, the card produces one resource of the player's choice from among those that their city doesn't produce through the use of its brown and gray cards or the initial resource of their board. Clarification : the resources produced by the yellow, white and black cards aren't taken into account. This card is worth 4 Victory Points and every other player must pay 1 coin to the bank for each stage of their Wonder they have built. 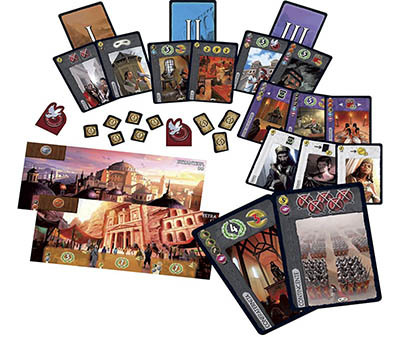 The Leaders and Cities expansion are compatible and you can play 7 Wonders by combining them. However, we suggest that you discover Cities by setting Leaders aside at first. From the moment she enters play, each amount of coins taken from the bank is increased by 1. This increase is limited to one coin per turn. Example : discarding a card earns 4 coins, a tavern 6, ..
Clarification : coins given by neighbors through the purchase of resources isn't considered coming from the bank. Queen of Egypt. Two things are remembered about this ancestor of Cleopatra : the constellation named in her honor and the coin stamped in her image, the first in history to bear the portrait of a woman. The player can build one black card per Age for free. Roman Emperor. His short rule is often associated with a bloody period, debauched and despotic, in which everything was a pretext to have monuments to his glory erected. From the moment he enters play, Diocletian earns 2 coins for each black card that the player builds. Roman Emperor. 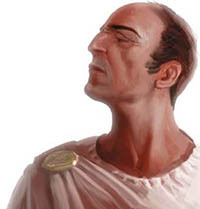 Of all leaders of Rome, he was the one whose economic reforms were the deepest and with the most consequences. His system of taxation of landowners will be used for quite some time as a model in the western middle-ages. Each black card is worth 1 victory point at the end of the game. 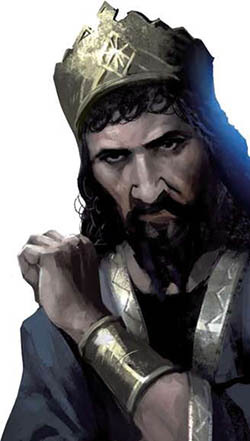 Persian Emperor. Born to discord and revolts, his rule was marked by a fortification of the empire's borders. Remembered mostly for having an entire city built : Persepolis. When Aspasia enters play, the player takes a Diplomacy token. (Asasia is also worth 2 victory points at the end of the game). Wife of Pericles, known for her education and her culture, which earned her respect and admiration to the point where she influenced the thinkers and men of state of her time. From the moment when she enters play, each Defeat Conflict token counts as a Shield symbol for all future conflict phases. (Place your Defeat tokens on the Semiramis card to make it clearer). 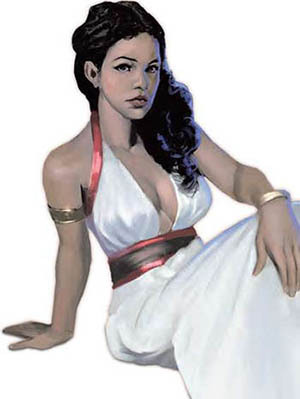 Semiramis is an idea of Gled Semenjuk, proposed in the Semiramis contest. The card earns 5 victory points and causes the loss of 3 coins from all the other players. The card earns 1 victory point for each black card present in the two neighboring cities. The card is worth 1 victory point for each Victory Conflict token present in each of the two neighboring cities. Clarification: the value of Victory Conflict tokens (1, 3, or 5 points) isn't taken into account. Each token is worth 1 point to the owner of the Guild. The first stage earns 3 victory points. The second stage costs 7 coins to build and earns 7 victory points. The third stage earns 7 victory points. The first stage earns 3 victory points and causes the loss of 2 coins for every other player. The second stage costs 14 coins to build and is worth 14 victory points. The second stage earns a Diplomacy token and 2 victory points. 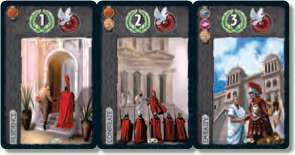 The first stage earns a Diplomacy token and 3 victory points. The second stage earns one Diplomacy token and 4 victory points. If the Free City must discard coins, the player who is playing the City this turn decides if it pays or if it contracts Debts. If the Free City puts a card in play which causes monetary losses, both players are affected (the player who has chosen the card for the Free City isn't exempt). If the Free City puts a Diplomacy card in play, it doesn't take part in the military conflict of the corresponding Age and the two players only face each other once. The following rule changes allow you to play with 8 players. Prepare the game for a 7-player game (all the Age I, II, and III from the basic game, 9 Guilds, and 7 black cards of each Age). At the beginning of each Age, deal 7 cards to each player. Each player will play 6, exactly as in the 7 Wonders basic game. Note : the 8-player game is mainly intended for the team play variant. 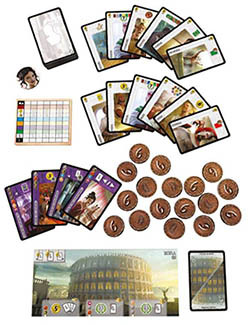 During your games with 4, 6 and 8 players, you can now play 7 Wonders with a variant for 2-player teams. The teammates must sit next to each other. buy resources from each other while they can build a structure through a chain. Important: When a player puts in play a card which causes a monetary loss, the player's teammate must also pay that loss. In the team game, the conflict resolution and Diplomacy differ from the classic game. In the team game, the teammates do not wage war against each other. Each player will have to face the opposing city which neighbors them. a victory during Age III is worth 2 Conflict (Victory) tokens each worth 5 victory points. defeats are each worth 2 Conflict (Defeat) tokens with a value of -1 victory point. A player who puts a card with the symbol in play takes a Diplomacy token from the bank and places it on their board. During the next conflict, the player still takes part in the resolution, but they and their opponent only take a single Conflict token instead of two. The use of the Diplomacy token is mandatory; it is then discarded. The use of a Diplomacy token by a player doesn't affect their teammate. It is possible for a player to win the conflict even if that player has played a Diplomacy token. If the 2 members of a team have each played a Diplomacy token, they each take a single copy of the Conflict token, as do their respective opponents. Example : Cyril and Tina are teammates. During the Age III Conflict resolution, Cyril uses a Diplomacy token. He loses the conflict (his opponent has a superior military force) : he takes only 1 Defeat (-1) token and his opponent a single Victory (+5) token. Independently, Tina wins the conflict, she takes 2 Victory (+5) tokens and her opponent 2 Defeat (-1) tokens. Each player totals his or her victory points and then the two teammates total up their score to get their team's score. The team with the highest score wins.